Will an Editor Make Me Follow Lots of Rules I Don’t Want to Follow? I’ve been thinking a lot lately about rules. Why they exist, why we follow them, why we don’t follow them. Editors often get a bad rap for being enforcers of seemingly stupid or arcane rules that (almost) no one cares about, but that’s not the way I work, so I wanted to address this concern. Some of my clients have a lot of ideas about how they want things to be formatted and styled. Sometimes I don’t agree with all of their decisions, but it’s their book, not mine. 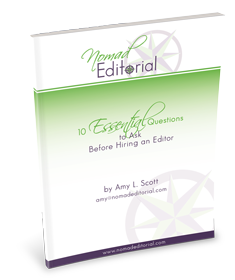 Most of my clients are planning to publish their books themselves, and the beauty of self-publishing is that they don’t have a publishing company (and its editors) insisting they follow a house style guide. I don’t want to rain on a client’s parade by making her follow my rules either, but I also want to be sure we’re doing what’s best for the book and for readers. Here’s how I usually handle differences of opinion with a client. First, I’ll share with my client the “conventional” way of doing things, because I think it’s a good idea to know exactly what you’re rejecting before you reject it. Many rules about grammar and punctuation came about in order to improve readability, so they might be worth following. Another thing to consider is that if you care about your book looking like a traditionally published book (which, in my opinion, will make both you and your book look more professional), you might want to follow the same style that traditional publishers follow, especially in terms of formatting and style (I’m talking about things like capitalization of headings and whether to spell out numbers, for example). If the client is aware of how things are normally done and still wants to follow her own style, that’s her call. But if the choice is leading to problems in either consistency or clarity, I’ll push back and ask her to reconsider. If you have your own preferences for how things look in your book, that’s fine, but consider why that’s your preference, and if there’s any good reason for doing it that way. If your style is really different than what people are used to finding in books, it might be a distraction more than anything else. In the end, consistency and clarity are the two most important things. As long as you’re doing everything you can to make sure your work is consistent and clear, I’ll support you and the decisions you make about your book.